The idea hatched in the dark recesses of one Joseph Look's mind should have prompted a close friend, a caring neighbor, or a compassionate clergyman to slap him upside his head and scream "Look, Joseph, save yourself and us the agony, it ain't gonna cut it!" If someone had, it would have spared Look the dishonor of having produced one of the strangest and least 'ergonomic' planes that ever lept from the drawing board into production. Look, of South Abington, Massachusetts, received his patent on July 20, 1875. The manufactured plane is identical to the very detailed patent drawing, right down to the screw that holds the tote in place (from the bottom). Many patents underwent some modification from the patent drawing to the production as a result of manufacturing hurdles and/or ideas that looked good on paper but didn't look that way in the flesh. One look at Look's plane and you'll immediately be struck by its austerity - there's no front knob, no lever cap, no frog, and just no pizzazz. Look had very good intentions with his design, that being to make a chatterless plane, which doesn't choke, and to lower the iron's pitch to the absolute minimum so that tearout is eliminated. Lofty goals, which the plane solved quite well, but he simply didn't go far enough to make the plane comfortable to use. The iron is pitched at 0 (zero) degrees and operates in the same manner that a paring chisel does - the flat side of the iron is downward with the bevel up to yield less leverage on the shaving as it's lifted from the wood's surface. The iron is recessed into the sole of the tool. In fact, the iron itself is a portion of the plane's sole. A threaded vertical screw is countersunk into the iron, and pokes through the main casting, where it receives a wing nut. This nut locks the iron to the desired position over the range through which the iron can be positioned. In other words, the iron can be moved backward and forward either to open or close the mouth and then locked in place by tightening the wing nut. A very simple and efficient means to regulate the mouth. A plane needs more than just an adjustable mouth to make it worthwhile. It also must have a means to regulate the iron's set; i.e. how deeply into the wood it will cut as dictated by the workman's intent. Look's patent accomplishes this via two set screws that are positioned toward the iron's cutting edge. These two screws make contact with the iron below, and are tightened to move the iron downward from the casting, which results in an increase to the iron's set. Loosening the screws has the opposite affect. While this method of changing the set seems simple and straightforward, it has real limitations due to the difficulty in getting both screws to sit in the same geometric plane in order for them to make satisfactory contact with the iron; if one is set a hair bit more than the other, the iron will want to twist during use, yielding a shaving of uneven thickness across its width. This isn't so much a problem when taking thicker shavings, but it is when taking ultra-fine shavings, which is something normally expected of a smoothing plane. Only two of these planes are presently known, with both being smoothers. The plane has a crossrib in the main casting, just forward of the mouth. On this crossrib is a raised bump, and it seems that it's this bump that Look intended to be gripped by the forward hand while using the plane. Thing is, it isn't comfortable at all, and why Look didn't put a knob on the tool, something that is very easy to do, leaves one scratching their head or soothing their blisters from using the thing. 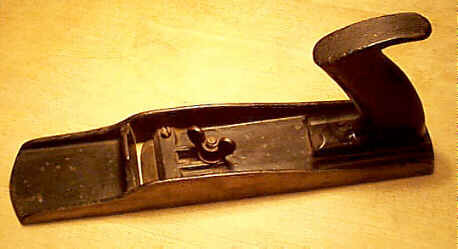 This same crossrib can also be found on the smaller block planes manufactured by the Boston Metallic Plane Company and it seems logical to conclude that that firm manufactured Look's failure.